In order for someone to be as strong and levelheaded as the Walking Deads Daryl Dixon, the right situations and exuberant amounts of dedication are required. Take a step in the right direction with the Walking Dead Daryl T-Shirt. Daryl himself is holding his signature crossbow over the words Were All Infected on the back of this cotton jersey tee. 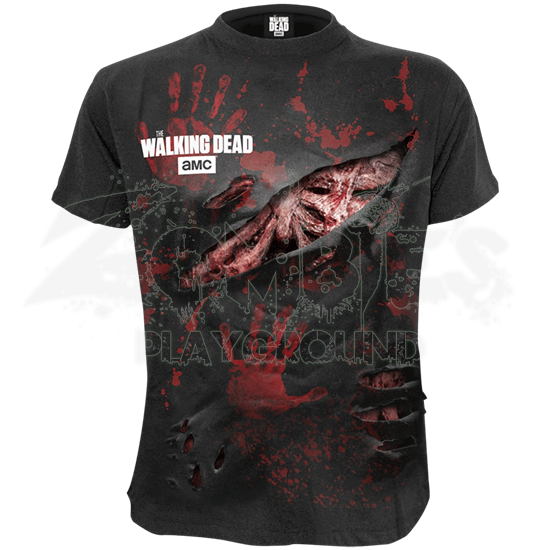 The front features a dual-layered design with an actual torn top layer over a graphic of the decrepit body of a walker. This graphic t-shirt has been printed with Azo-free dyes, giving it a comfortable feel that can be worn any time of year. Die-hard fan or casual watcher, the Walking Dead Daryl T-Shirt is one gothic garment that will please with ease!